Hotel JL №76 is a 4-star hotel, housed in 2 completely renovated 18th-century mansions in the heart of Amsterdam's museum and fashion district. It offers design rooms with luxury features and individually designed wallpaper. JAN Eat & Drink offers an elegant setting to enjoy a light meal, snack or drink. This boutique-style hotel offer bicycles for hire. Museumplein and the Van Gogh Museum are within 5-minutes' walk. Leidse Square is 220 metres away. The famous P.C. Hooftstraat luxury shopping street is 150 metres from the hotel. The air-conditioned rooms feature 1 of 5 unique themes and include an iPod docking station and a flat-screen TV with a DVD player. 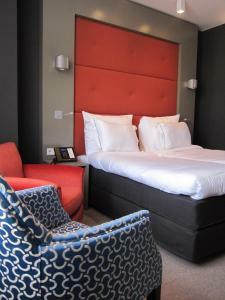 Each room is furnished with a luxurious COCO-MAT bed and comes with a Nespresso coffee machine. Guests also benefit from a DVD library and free use of an iPad. The lounge, restaurant and private garden offer a relaxing place for guests to sit and enjoy a drink whatever the weather. The hotel includes an honesty bar where guests can make themselves a drink or bite to eat at any time. There is also a large collection of art in the public areas.